On Subhas Chandra Bose's 121st Birth Anniversary, also called Netaji Jayanti, here are some hair-raising quotes from the national hero. Subhash Chandra Bose was born on January 23, 1897 in Orissa's Cuttack. He was one of the most prominent Indian freedom fighters during the country's struggle for independence. He revived and led the Indian National Army, or the Azad Hind Fauj, in 1943 and also formed alliances against the British during the World War II. He was given the honorific 'Netaji' by German and Indian officials in the Special Bureau for India in Berlin. He is the creator of the slogan "Jai Hind", which is a popular patriotic salutation in the country. 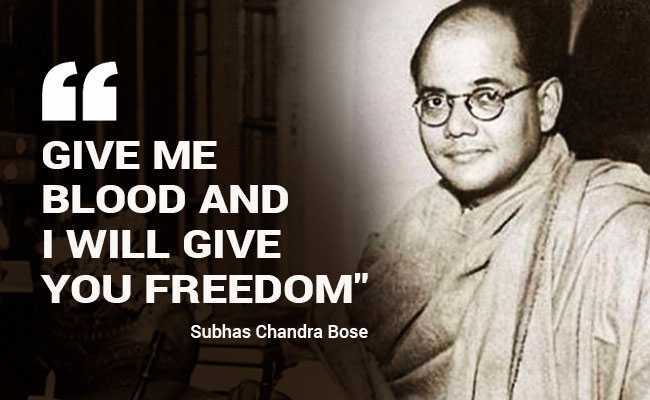 Subhash Chandra Bose was the first person to address Mahatama Gandhi as the "Father of the Nation". He associated himself as a socialist and was influenced by Swami Vivekananda's teachings from an early age. He is revered as a patriot and national hero. He died in Taiwan in 1945, reportedly due to a plane crash. On Subhas Chandra Bose's 121st Birth Anniversary, also called Netaji Jayanti, here are some hair-raising quotes from the national leader. India is calling. Blood is calling to blood. Get up, we have no time to lose. Take up your arms ! we shall carve our way through the enemy's ranks, or if God wills, we shall die a martyr's death. And in our last sleep we shall kiss the road that will bring our Army to Delhi. Reality is, after all, too big for our frail understanding to fully comprehend. Nevertheless, we have to build our life on the theory which contains the maximum truth. I have no doubt in my mind that our chief national problems relating to the eradication of poverty, illiteracy and disease and the scientific production and distribution can be tackled only along socialistic lines.